Our specialty is the service of early Ford or Mercury 3 speed standard transmissions from 1928 up through 1962. This includes the Ford and Mercury 3 speed overdrive transmissions from 1949 through 1962. We do not repair any automatic transmissions. If you are confident in your skills and wish to simply purchase the parts you need, please call our sales office to check price and availability for the items you need. We offer an online parts price guide (see link below) with many of the popular pieces listed. Not all items are listed so be sure to check with us if you don't see it online. Please consider purchasing our book: The Ins and Outs of Early Ford Transmissions , which is a great guide in the identification and assembly of the 1932-52 transmissions, plus much additional information (gear charts, serial number charts, parts specifications, etc) to help you. Click here for info on the book. The 1949 and newer passenger car transmissions have a longer, slender shape and require a different shape for the wood crate. We recommend building a crate with general dimensions of about 16" x 16" x 36" long, using the same type materials as the above crate. You will have to place wood cross braces and supports inside to handle these longer transmissions, including the overdrive types. For UPS shipping purposes, you must keep the overall weight under 150 lbs. Any transmissions that are heavier than about 125 lbs will almost certainly require shipping via LTL freight on a wood skid. Contact us before you attempt to ship via any other method than UPS Ground. DO NOT SHIP A TRANSMISSION TO US BEFORE PLACING A REBUILD ORDER ! We have the special tools and equipment in our shop, plus the experience of many rebuilds to provide you with competent and efficient repair of your transmission. Our shop rate is currently $95.00 per hour. There is a charge for the casting cleaning process (including repaint) for the four pieces that make up the overall housing. This is a thermal bake process plus a media blast before paint (standard colors: cast blast gray, black, antique Ford green, or antique Ford blue). The charge is $85.00 for regular 3 speed transmissions and $95.00 for overdrive transmissions. We do not quote a standard rebuild charge since we do not know in advance what parts might be needed beyond the usual bearings, seals, gaskets, etc. Once we have completed the teardown and inspection of your gearbox and gears, we will contact you with an estimate of your total cost of the rebuild. A common question is how much do we charge for a rebuild. The common wear parts (bearings, seals, thrust washers, gaskets, etc) will typically run about $225.00 to $295.00 but can go higher if additional pieces are needed. A regular three speed toploader transmission typically takes about six hours actual shop time to do a normal teardown, cleanup, and reassembly. Regular side loader transmissions take about 6.5 hours. Overdrive units (1949-60 Borg Warner type) will take a minimum of 10 hours but can take up to 13 hours depending on the level of rusted or damaged parts. A deposit of $200.00 is required with the start of a regular standard transmission rebuild job. A $300.00 deposit is required on all overdrive transmission jobs. The balance (including return shipping cost) will be assessed on completion of the work. We accept Visa, MasterCard, Discover Card, and American Express. All rebuild work must be paid by credit card. We welcome customers who wish to visit the shop or plan to drop off your transmission, but require that you make an appointment ahead of time. Our shop is located in the eastern Cincinnati area (southwest Ohio). If you wish to purchase a complete rebuilt transmission, we can build it to order, subject to availability of all the necessary components for your specific transmission application. We do not require a core transmission, nor do we offer an exchange program. If you have a core transmission that you would like to send us for credit, we will gladly accept that for evaluation toward any credit value on the parts, subject to our inspection of the transmission (or individual gears as may apply). Core transmissions or internal gears must be shipped prepaid to our Milford location, and MUST include full name, address, and contact telephone number with the shipment. We suggest that you contact us prior to shipping core items to us. 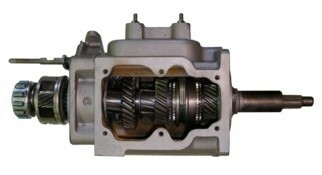 Please call us to discuss building a complete transmission and for price quotations. Effective beginning February 2018, all transmission shipments will be handled ONLY on Wednesdays due to the logistics of transporting the complete core or the finished transmission to the local UPS facility. Your rebuild might be completed on a Wednesday but the final transaction and shipment may not occur until the following Wednesday. We apologize for any inconvenience or delay resulting from this policy. Also, effective July 2018, UPS will be charging surcharges for heavy articles that are shipped to a residential address. Our address here in Milford, Ohio is a commercial address. However, when we return the rebuild to you, a surcharge will apply if we are sending the crate to your residential address. If you have an option to have it sent to a commercial address near you, please consider checking that out to save yourself money, and let us know. top loader transmission, toploader transmission, Ford toploader, Ford three speed transmission, old Ford transmission, early Ford transmission, Ford transmission repair manual, transmission manual, transmission repair book, how to repair a Ford transmission, toploader repair book, Ford 1939 transmission, rebuilt Ford three speed transmission, Ford transmission rebuilding, Ford manual transmission rebuild.